I have seen a few posts lately about 'How to Be Happy' and 'How to Stay Positive' and I absolutely love them! I love reading other people's lifestyle post, I find it so interesting and they really inspire me! Since we are fully into to the colder weather I thought I would share what I do on my 'Lazy Days'. Now I know what you are thinking, lazy days equals lie ins but really you will feel so much better getting up early. It is just a great feeling being the first one up in your house, everything is so peaceful and quiet! Light a candle, turn the fairy lights on and make everything feel cosy! I can't start my day without breakfast, I tend to not touch my phone until I am fully awake so I whilst I eat I catch up on YouTube and any messages!! Having a relaxing morning means I am more motivated to do tasks, and getting up early means I can get more tasks done! I love to plan, and with more time on my hands, I like to sit down and plan. Plan my day, jobs to be done and plan upcoming blog posts. It makes me feel so organized and ready for the day. 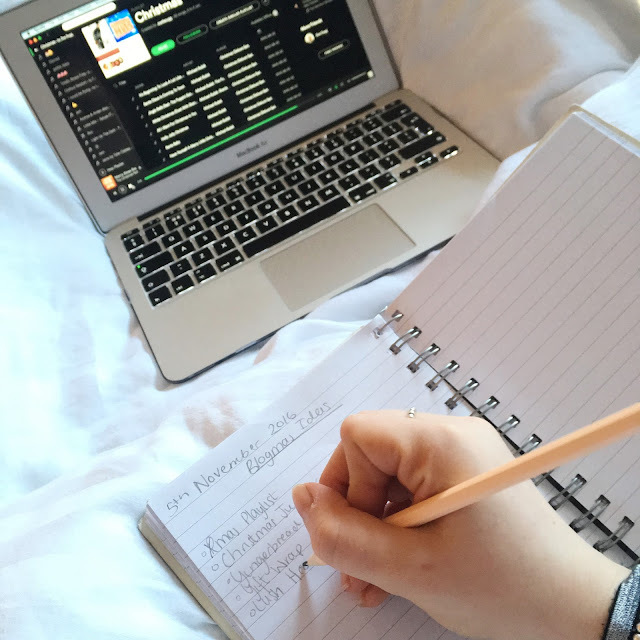 Blogging and having a full-time job can be hard, so when I have time off, planning my posts can be helpful to keep track what is going up and when. I also love writing what needs to be done in my day and then at the end of the day what I achieved, things like that can make you feel more positive about what you have accomplished!! I, like most people just let things build up until my room is a hot mess. A clear workspace makes a clear head, and that is so true, if things are not tidy then it stresses me out. 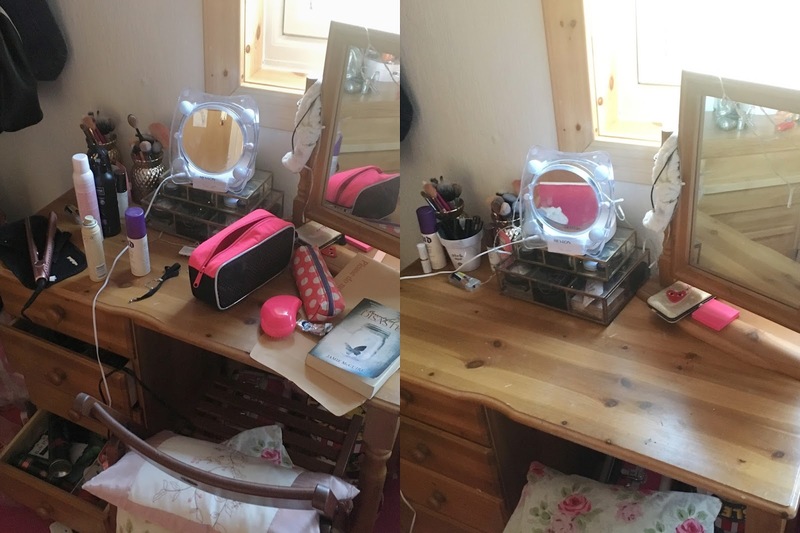 I know it is a 'lazy day' but it is so satisfying making your room neat and tidy, even though in a few days it will be back to the same old mess lol If I don't have a day off, I will do it at night, I love going to sleep after I have tidied my room knowing when I wake up it will be all clear! All my girls, or guys out there, is it just me who can't stand not having my nails painted! I hate the look of my nails and I just feel 'naked' lol. So on my lazy days, I love giving myself a good manicure and pampering myself. Picking the colour, put on a good film and you will be relaxed in no time. The end result is also very pleasing!! However, on this occasion, it was stressful, trying to get a shot of myself painting my nails became such a task! Self-timer and my mouth came in handy!!! Lastly, you can't have a lazy day without a warm bath, a Lush Bomb, and a good book!! It is such a good way to wind down and relax! I tend to have my baths at night just to get me super chill and ready for bed, however, having a bath in the morning/afternoon has become my favourite thing to do!! I have mentioned before how I feel that I never have time to read, so spending 40 plus minutes in the bath is just complete 'me' time!! I want to do more of these lifestyle post as like I said I really enjoy reading and writing them!! It is all steam ahead for Christmas now and I am so excited!!! As you can see I am planning my post, so stay tuned aha!!! 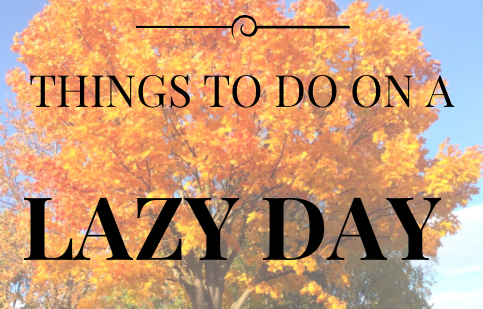 Let me know what you do on your 'Lazy Days'??? Planning is actually one of my fave things to do! Love the layout of this post! This sounds like such a perfect lazy day! Your bedroom is so cosy! I agree with most of this... but I can never convince myself to get up early on lazy days/days off! I felt so relaxed just reading this!! I do a lot of the same things on my lazy days- tidying is huge with me, goal setting at the start of the day is awesome, and giving myself a mani-pedi is so gratifying! This is great, ty!! I loved this post gorgeous and the photos are lovely too! I love to listen to music, I find I don't go a day without it. Your bedroom is so cute and I agree, I beilive a lazy day can still start early - not that we have much lazy days but they usually do start early and planning is always number one! Thanks for sharing! Fairy lights are a great idea! I need to put them up in my apartment. You are totally right about getting up and making an early start: I always feel energized when I accomplish a lot while it's still rather early in the day! I love tidying! I know most people hate it but I absolutely love it! I just like finding old things and giving my space a new look. It's not often I get a proper lazy day but if I do, I just sit and watch TV/films all day long and eat all the snacks! I'm number one fan of having a lazy day and loved this post! I love having a bath with a lush bath bomb and face mask on a lazy day and also just slobbing on the sofa or in bed watching Netflix! Fab post! Oh my gosh, your room is goals!! very pretty! love the picture of the nail polish, good job girl! I love posts like these! Your lazy day sounds great, my lazy day goes more like: wake up, lie in bed and watch netflix all day, sleep! ha. I think I definitely need to get into the habit of getting up, getting breakfast and planning my day. I am so doing everything on this list tomorrow, I always use my weekends to plan, plan, plan my life away!